With the change of seasons upon us, the Lord has had me consider the importance of us going back to our roots. Every morning on Facebook [Follow me here: Dr. Michelle Bengtson Facebook] and Instagram [Follow me here: Dr. Michelle Bengtson Instagram], I post a “Good Day” devotional where I consider the promises of God and why that should encourage us that despite our circumstances, we can still consider it a good day. Recently, during the fall months, I paired those fall devotionals with photos I had taken. Several people commented about the photos and the gorgeous fall color. Those photos make me smile because I remember exactly where I was and who I was with when I snapped them: I had journeyed home from Texas to Michigan to spend time with family and enjoy the fall foliage (in north Texas, we generally get either green or brown, and temperatures are usually very hot or less hot). I’ve taken this trip several times and each time I journeyed home, I’ve been filled with mixed emotions. I’ve had great anticipation and excitement over the opportunity to spend time with family and friends whom I dearly love yet do not get to see often. I also face uncertainty: how have people and places changed? It can be hard to reinsert yourself in a place you left and with people who have moved on with their life in your absence. I’ve also experienced some sadness because I hate to say goodbye, especially without knowing when we’ll see each other again. Regardless of the emotions tied to the trip, each trip home has held more importance than I had anticipated or realized. When I left Michigan as a late teen, it was a very painful time in my life. My father had recently died, and my mother remarried when I was a junior in high school. When my mother remarried, my brother and I moved to another city with my mother and step-father. We were both uprooted from our long-term friends and a school and church I loved. I graduated from this new high school and then my mother and step-father announced they were retiring early to Florida. This entailed uprooting me and making me start over again. As a still-grieving introvert, this brought pain upon pain. That move separated me from the friends I loved, extended family I was close to, and the church family I had known since birth. Returning home to visit meant returning to the pain and stirring up old wounds, ripe for another layer of healing. Each visit home offered a chance for reconnection with the friends and family I loved. It afforded the opportunity to view my previous life from an adult perspective (when did the school become so small? A&W root beer hot dogs weren’t as good as I remembered, etc.). Each opportunity to return home reassured me of God’s goodness and faithfulness to me during one of the hardest times in my life. Each trip home gifted me with new memories to appreciate and enjoy. Thus far, each journey home has been in the fall. As fall comes to a close and the crest into winter comes upon us (or as much winter as we get to experience in North Texas), my thoughts keep returning to Mary and Joseph prior to Jesus’s birth, and their return home to Bethlehem, Joseph’s roots. TS Eliot said, “The end of all our exploring will be to arrive where we started and know the place for the first time.” Our heritage remains our link to the past: to our core beliefs, morals, values, customs, and practices. It offers a world-view and perspective on the world that influences how we think and behave. Sometimes we keep moving, because that represents progression, whereas staying represents limits and boundaries. Yet as humans, we crave home—the community, comfort, and stability it brings. Roots are our foundation. Consider a tree: the roots are the foundation and are what keep it anchored in times of difficulty. A tree’s branches go in all different directions, but undisturbed, roots grow deep into the earth and proliferate extensively, seeking the soil and nutrients needed to grow and remain strong. We tend to be the same way in our lives—trying out new places and new things to see what fits. We need to get back to what makes us strong…our roots. Branches hold leaves, which change with the seasons. They never stay the same for long. They weaken and fall from the branches. But the roots always remain the same, in the ground and strong. The branches and leaves can be swayed by the wind, whereas the roots remain stable. The only way roots can be moved, is during a bad storm which soaks the soil. And wind can pull the roots up and destroy the entire tree. That’s akin to what happens to us if we let sin soak in our lives. It can cause our roots to be affected, which then affects our entire lives. “Storms make trees take deeper roots” (Dolly Parton). The same is true for us. Storms challenge us to know what we believe and to hold fast to those beliefs. Returning to our roots helps us understand where we began our journey, and perhaps remind ourselves who we are. Paul declared “Are you so foolish? Having begun in the spirit, are you now made perfect by the flesh?” (Galatians 3:3). Paul was in essence telling the Galatians that we must live by faith. They had been strong in the beginning and had drifted from it. He underscored the importance of going back to their roots, to what they first knew. Your roots impact your past because they help us understand where we came from and how we developed into the person we are now. Your roots affect your life now because they help us remember what is valuable. Your roots impact your future because they help us determine what path to take to achieve the desired results and avoid repeating mistakes. 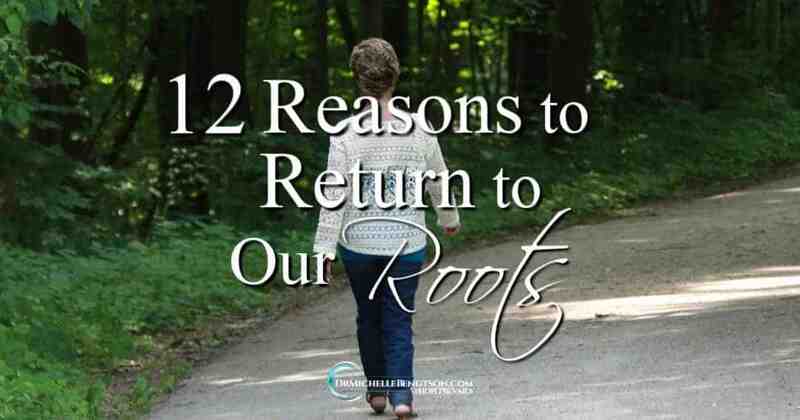 Returning to our roots offers several benefits:. 1. Returning to our roots allows for understanding. We learn and better understand our heritage and where we came from, and even why we possess the values we do. 2. Returning to our roots accelerates healing. It’s difficult to heal pain that we don’t acknowledge. Sometimes we attempt to move on from the source of pain, but all that does is bury the pain, which will at some point erupt like a volcano. 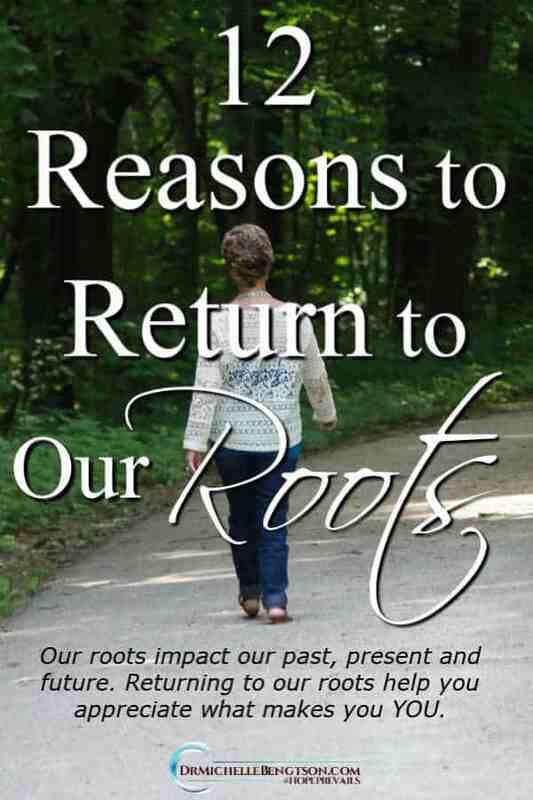 Returning to our roots gives an opportunity to face our pain and let God heal it. 3. Returning to our roots offers reconciliation. Sometimes grudges were formed in our roots that have existed for generations, building up bitterness, resentment and unforgiveness, and causing a physical or emotional separation from others. Ignoring the situation benefits no one. Returning to the scene of such pain and discord can be the beginning of reconciliation and restoration. 4. Returning to our roots provides context. When we return to our roots, we can see why our ancestors did what they did and believed what they believed. It provides a context with which we can better understand attitudes and behaviors. 5. Returning to our roots offers longevity. It offers the opportunity to remember why you cherish lifelong friendships that money can never buy. 6. Returning to our roots affords the opportunity to learn and grow. People often move to escape their problems and the circumstance. The problem is, no matter where you go, the common denominator in each circumstance is you. You can’t escape you, so why not learn from your situations and grow? 7. Returning to our roots lets us appreciate the familiar. Whether its visiting people or places, returning to our roots lets us relish in the familiar memories of who we were and what we did in a previous time. There is comfort in the familiar. 8. Returning to our roots grounds us. There is something important about remembering the things that made you, you. Like the beliefs you were raised with, the traditions that held meaning for you, the character your family instilled in you. They give you a firm foundation on which you can build. 9. Returning to our roots inspires us. Seeing and remembering the accomplishments, the challenges, and the victories of those gone before us can inspire us to continue through the difficulties and fight for what we deem important and valuable. 10. Returning to our roots reminds us of our identity. It’s important to know who we are, whose we are, and the characteristics we share with those before us. When doubts and insecurities come (which they will) when we remember who and whose we are, it fuels our strength to stand firm. 11. Returning to our roots helps us heal after loss (whether it be the death of a loved on or even the loss of our own health). In order to fully heal, we often need closure for an event. Returning to our roots offers a context for that closure. 12. Returning to our roots provides connection and meaning. Nobody truly wants to live in isolation. It is the people who love us, cheer for us, encourage us, teach us whom we most easily connect with. Life is painful in isolation, but burdens shared are easier to bear, and joys shared are increased. This holiday season, whether you return to your roots physically as Mary and Joseph did, or through the traditions and memories you honor and celebrate, may you appreciate what makes you uniquely you and the call God has on your life. wow, so very well thought out and expressed. God is using you to express some eternal truth and a hope filled abundant life’ Thanks. when you look back at some of the ‘why’ that God slowed you down, go back to this article, the deep wisdom, the profound statements, the ability to translate that into a list so people can understand and apply it for them, God is using you for His Kingdom messages. It really hurts when God slows us down, making a wretched shoulder turn away and an arm to not respond, but God is in that too, driving each of us deeper into His Word, His Truth. Must be a poem somewhere about ‘part of the pain, is to help us drain… part of the pain is for His Fame…. part of the pain is to know His name… Not about us, but to Jesus claim… whew, where did that come from??? Some of those lessons have come the hard way, but maybe then they will impact more people, and maybe then some won’t have to go through the same steep learning curve. Learning to slow down and lean into Him is a valuable lesson for all of us. God rested the seventh day from all His work…there must be something in that gift to us. He isn’t a task master asking us to do more. He’s more interested in the time we take with Him. That restores the soul. Very good article! I really enjoyed reading this. I think sometimes we forget where our roots are and how to get back to them. Thank you so much for this reminder. It is definitely a thought to ponder. Thanks Angela. it’s always nice when you visit the blog. Sometimes our roots are specifically where we were born, but where Gd birthed something in and through us. Hope the pondering leads you to truth that encourages your heart. I know that lifestyle of frequent moves is hard. We did that for years so I could finish my medical training. Now I’m happy to say that as a married couple we have now lived in the same place longer than we haven’t. My roots are pretty well gone if I look backward, but God has rooted me here on a country hill with my husband and kids. We have a great church family, and my roots are sunk deep here–a blessing I never expected and didn’t even have the sense to pray for. God is good. Sometimes our roots aren’t where we were born, but where God birthed something in us or through us or for us. So glad that our past can be a valuable teacher. 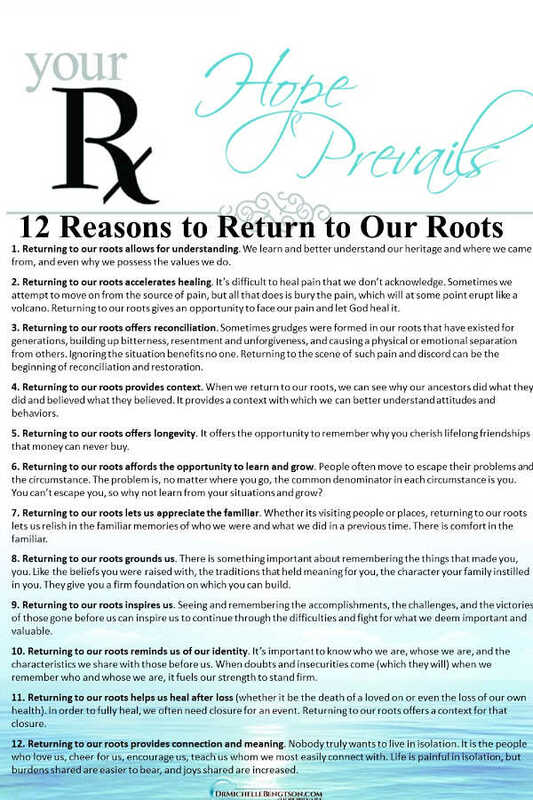 Interesting reasons to return to our roots, many of which I need to ponder some more. Thanks, Michelle! So glad to have you visit the blog. I pray you enjoy your few moments here and leave encouraged. Blessings. Michelle, I appreciated your insightful and thoughtful post. As a registered clinical counsellor and educator the encouragement for people to return to the roots so they can face and deal with some unresolved issues, learn about how their identities and narratives were formed, all help and contribute to our becoming grounded, healed, and transformed. It can be challenging and emotional work, but the benefits are so worth it. Thank you for your service to those in need. Yes, it can be challenging and emotional work. I’ve experienced that too as a neuropsychologist, but I get excited for others when I can see healing begin. That’s part of the abundant life Christ offered. Some great thoughts about roots. I have a troubled past with my roots as well but I have to agree with everything you said. Visiting from #TeaAndWord. I can understand. Thankfully, God can take our troubled past and make something beautiful out of it that will minister to others. I’ve never really thought much about returning to my roots–we moved a lot (about every 2-3 years) when I was growing up. The longest I’ve lived in any place was the 11 years we spent in Montana where our girls grew up–I experience good things (including healing and resolution) when we visit there :). I think there is a foundation there that can’t be mimicked any place else. That’s why there is healing there.